It has been ten years, last April 6, since we exchanged vows to love and cherish, till death do us part, etc., etc., etc. Thinking of something to surprise Vangie on our tenth wedding anniversary, i started planning on how to send her a singing telegram. The last time I did this was about 11 years ago before we were married. 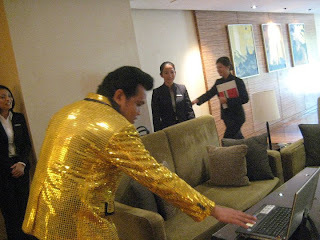 About 2 months before the event, I tried searching the internet for a singing telegram. Unfortunately, there are just a few people/or companies offering such service. Then I discovered Mr. Alex "Al-vis" Torres, an Elvis Presley impersonator who performs such service. He brings along a laptop where he displays a presentation while singing. I called him up and arranged for him to go to Marriot Hotel and deliver the "message". With a singing telegram located, my next task was to find an accomplice in my wife's office who will help me make sure that my wife will be at the right place and time when Al-vis arrives. I emailed Michelle if she was willing to help me with my plan to which she enthusiatlically agreed. This started a month long correspondence between the two of us under my wife's nose. find a place where the telegram can be delivered because items are not allowed to be delivered personally to their office. I left it to her about the details of the venue. I was to learn later that they had to ask permission from the General Manager for the use of one of the meeting rooms. I had also ordered flowers about a week before our anniversary which I was to personally deliver to her at the hotel when I pick her up on our anniversary day. Finally, the day arrived. Vangie was told to go to the board room but was not told why. Almost all her officemates and Al-vis were already waiting for her. And so began the serenading of Elvis Presley hit songs: Love me tender, Teddy Bear, Can't Help Falling in Love, etc. Vangie was a little bit embarassed I guess but I am sure she loved it pretending to laugh through the entire affair. 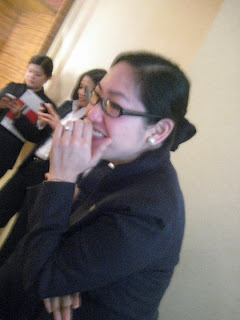 One officemate's eyes began to swell with tears, while another one was so "kilig", while the rest giggled. All had a good laugh and it was on a Holy Wednesday. Her colleagues documented the whole thing via photographs and videos. I still have to get a copyof the video though. Vangie immediately called me after the surprise and asked to know who among her officemate helped me in carrying out the surprise. I pretended that I have no idea. Somehow she found out later. I told her that I will pick her up early and maybe we can have an early dinner. Together with my daughter, whom I brought along in our office for the day, we picked up Vangie at her workplace. While waiting for her at the lobby, we met some of Vangie's officemates and told my daughter and me what happened during the occassion. 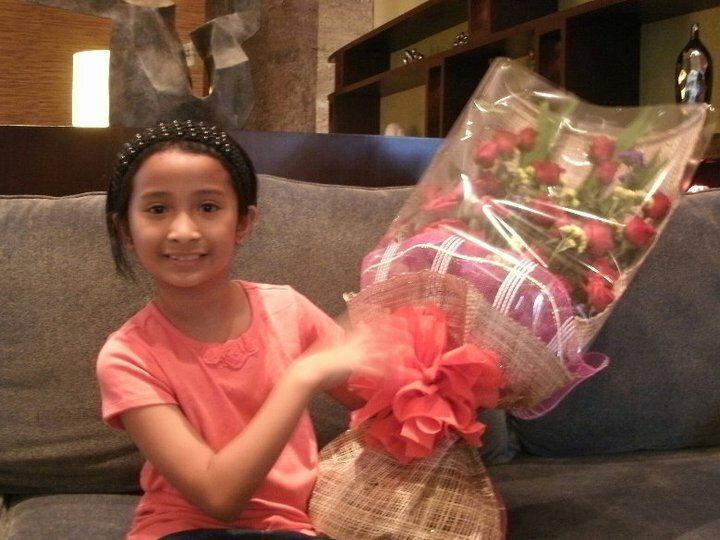 They told us that they will immediately tell Vangie that we're already there waiting for her. 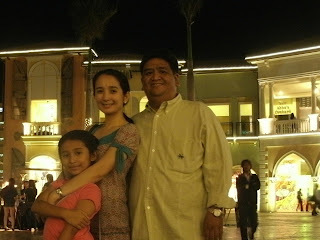 ﻿ After picking Vangie from her office, we immediately went to Piazza Venezia in Mckinley Hills for dinner. Since it was still early, we walked around and tried to look around. The place was still not finished but a lot of restaurants have already opened. We sat at the Piazza for awhile and people watched. We had dinner at the Tokyo Cafe. The menu was more Western than Japanese. I only had a caesar's salad while my wife and daughter had a pizza and pasta, which they shared with me. The food was affordable and yummy. It was already dark when we finished. 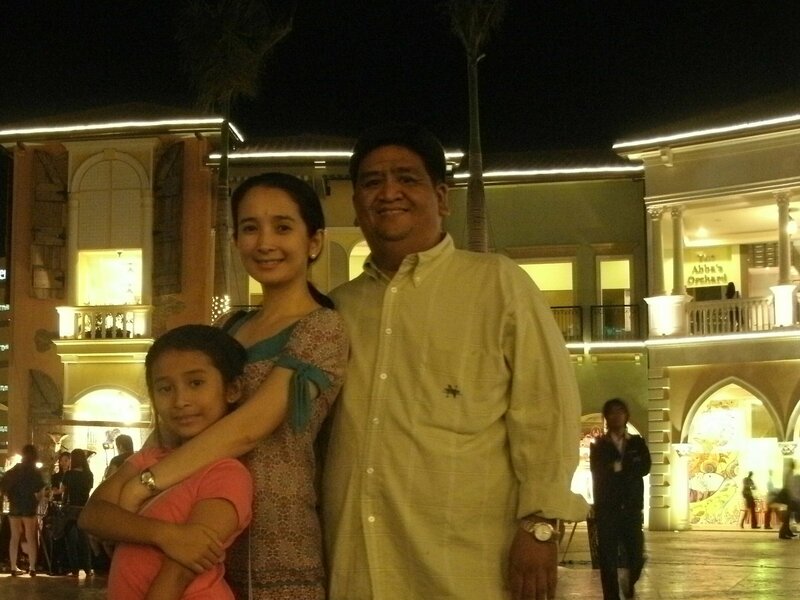 We had a last stroll around the Piazza before we finally went home.